Take your business efficiency to new heights and greater profits! “I liked the very structured approach, analysis of our ops, deep dive, strong involvement with the teams, resulting in buy-in and ownership, good to visualise processes and put them in workflows”. Cornelis Ouwehand. Big Wednesday and Machine. ”Again to reiterate, thank you SO much for taking the time to speak to all of us. Your presence here has been invaluable and I’m really excited to see the enthusiasm that you managed to generate amongst the entire team, but particularly in terms of getting the management team to buy in to it and back the drive to improve our way of working and our business fundamentally. By establishing those workflows for us, we’re already on to a far better way of working. And, as discussed, once we start getting the basics right, we can really look towards the other benefits that Chase can provide”. Ashley Barnes. Magnetic Creative. Chase Business Process Consulting will help you to gain a competitive advantage by turning you into an athletically lean, highly productive organisation. We’ll show you how to achieve greater efficiencies, lower costs, faster output, and happier clients. Chase Business Process Consulting is built on decades of experience in the advertising industry. And it’s based on practical insights gained from every conceivable agency model. With Chase at your side, you’ll have a unique strategic advantage – one that will help you to stand out in a competitive market. You’ll be amazed at how much industry research we’ve done to make our Chase Agency Management application one of the top advertising assets in its class. Firstly, we originated directly from the needs of the advertising world. Plus, we’ve spent years analysing a multitude of organisations to ensure our products can service many business models. It’s no surprise then that we’ve accumulated vital knowledge and insight into how agencies and corporate departments operate. While Chase is the proud offspring of that information, there’s so much more left to offer. So we took what we’ve learned and packaged it into a service that will give you the edge to succeed against ever increasing competition. Document the as-is status of your business operations. Identify areas where improvements are required, and formulate a plan to become more performant through our comprehensive GAP analysis. Redesign your company structure, roles and responsibilities to make communication simpler and more effective, and make your staff accountable. Define and implement controls that give you total command of your resources so you can utilise them more effectively. Identify process elements that create bottlenecks and impede service delivery. Shorten, streamline, or automate processes so your staff can get to the real work without delay. Create repeatable workflows that speed execution and ensure the same results and quality every time. Deliver faster service than ever before. Improve profitability through greater efficiencies. Remove complexity from your operations. And build your reputation as a responsive advertising partner of choice. 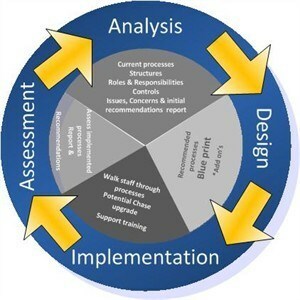 Current processes, structures, controls, roles & responsibilities are assessed and audited. Issues, concerns and gaps are documented and reported. Recommendations are provided on improvements. Future recommended processes are documented. Agreement on improvements to be implemented are reached. A comprehensive blueprint is delivered. Implementation via “walking” all staff through the blueprint. Chase Support trains all staff as required, based on the blueprint. In addition, we’ll assist you with the creation of an induction pack, briefing templates, CE’s, and custom reports. As a value add, we’ll advise on the improved usage of Chase across the business. On completion, you’ll have the ideal blueprint against which to run your business and train new staff to ensure uniformity of service and quality. Use the handy Talk to Us > Requests form to book an appointment.